A healthy lifestyle is still a hot topic for many of us. In the last few years, healthy lifestyle gadgets have become a popular choice among innovation gurus. From free meditation apps to health tracking devices, we have lots and lots of high-quality accurate products to monitor and improve our health. Below are some of the great advice and wellness products that are sure to improve your quality of life while making your true health guru. 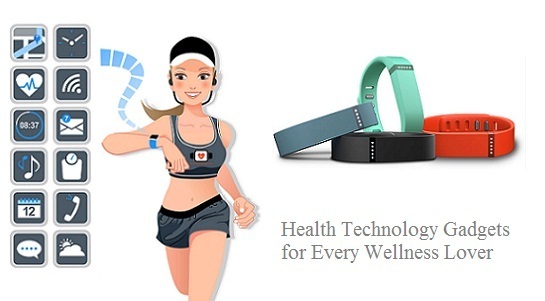 Wearable Fitness Trackers to monitor your body progress for various parameters. Right from your step counts to heartrates you can get all the data right on your smartphone. Even Apple watches are one of the best examples for tracking fitness activities. As technology advances, these fitness trackers provide more robust insights into your health. These features include calories burn, step count, a heart rate monitor, GPS route and distance and more. Having short sleeps in most common phenomenon among youngsters or professionals due to stress and heavy workloads. Using a sleep sensor means having a complete analysis of your sleep pattern that can easily identify problems areas in your sleep. The app track your progress and guide for better results with alarms, beeps, etc. The ResMed S+ is a perfect sleep sensor and monitor that can help you identify issues in your sleep pattern whether that be light, temperature, sound, or movement. Further it will track the progress and changes in your quality of sleep. With sleep being such an important part of our health, knowing it better using these solutions will ultimately lead to better health all around. Drinking water is absolutely necessary for a range of health benefits. But it is important to have its sufficient amount consistently at the right time of the day. Unfortunately, the seemingly simple task of drinking the recommended daily amount of water can be quite arduous. Luckily, staying properly hydrated is truly made simple with today's smart bottles! These smart bottles help you reduce the amount of efforts needed to monitor their intake. The Hidrate Spark 2.0 glows to remind you when to drink, and Geniway CloudCPU has a digital display to show water temperature and how much you have consumed, and then there are apps to do further analysis. Transcutaneous electrical nerve stimulation, or TENS, units are the best health gadget for wellness lovers who might have stiffs or sore muscles issues. These devices were a part of medical professional previously but now with the ease of use and readily available in compact sizes means you can have them at your home. TENS units use an electrical pulse to stimulate muscles and help soothe achy muscles after a workout when foam rolling just isn't doing the trick, or if you are feeling stiff from sitting down all day at work or while traveling. Breathe in ... breathe out ... could be so powerful when done correctly. These fantastic Meditation Apps will guide you to get peace of mind using guided imagery to sound therapy and deep breathing exercises. You can even use them further for reducing stress, insomnia, depression and more. This is probably the natural rather than technical gadget. When the strong light bulb is placed inside the large piece of pink Himalayan salt rock, it produces a natural ionizing electrical charge. Himalayan Salt Lamps are made from large pieces of pure Himalayan Crystal Salt that is hand carved and they offer a warm, cozy, orange glow when lit and help increase indoor air quality by releasing a small amount of negative ions creating a soothing and calming ambiance. Natural living proponents and other fans of Himalayan pink salt lamps claim that the negative salt ions released by heating certainly boosts blood flow, improve sleep, increase levels of serotonin in the brain, and calm allergy or asthma symptoms. These negative ions are said to neutralize electromagnetic radiation from household electronics, and even prevent the build-up of static electricity. Salt is hygroscopic so it attracts water molecules from the air and traps dirt, pollen, and smoke particles which are carried in water vapor. Once these airborne contaminants have been locked in the salt, clean water is re-released and thus it has a purifying effect on the air. Halotherapy, or the practice of salt therapy, has been a holistic treatment used as far back as ancient Roman and Grecian times to cure a lot of health and mental problems. Moving further, try combining the practice with other therapies. If you have an infrared sauna, incorporating the Microsalt Halotherapy Generator with the healing effects of infrared therapy will boost your mood than ever before. You will love calm and comfortable space around you all the time maintaining a sense of wellness at home. There are few ways to do this with today's technology gadgets, and from cleaning out clutter to redecorating to indulging in fancy bath products. With today's technology, you can take your home sanctuary a way further. Better examples of it include awesome home assistants, like Amazon Echo, that can take care of most of the common task you do and smart thermostats, like Nest, that allow you to program the perfect temperature at your home. The Netatmo Weather Station is a "home coach" that monitors elements such as air quality, humidity, noise level and temperature. Well, they might not prove immediately as the perfect wellness products, but surely give you peace of mind while giving you more time you need to focus on yourself for other productive activities. Chromotherapy or simply Color light therapy is the practice of using colors to correct any imbalances in your body. Each color aid in healing a different physical, the emotional or mental aspect of your life which are used in today's spas and few other wellness centers. With today's ease of access and compact gadgets era, you can incorporate them into your everyday life with light therapy gadgets. Simply turn your shower into a relaxing chromotherapy oasis with a color light therapy shower head, or improve your skin care regimen with a rejuvenating chromotherapy face mask that can help your face skin issues. Similarly to halotherapy, Chromotherapy is an awesome addition to infrared heat therapy in a sauna which will surely boost the sauna health benefits even faster. Whether you are looking for a wellness gadget or a simple technology aid, these wellness aids will bring amazing results in your life. As health technology continues to grow and make our lives easier by allowing us to monitor every inch of it, health and wellness seem to be at our fingertips. Just treat yourself with some of the great health gadgets and wellness products to enhance your quality of life.